(Nanowerk News) Understanding what causes materials to change from electrical insulators to metallic conductors is relevant not only to the development of practical electronic devices, but also for fundamental insight into the physical properties of materials. The organic material EtMe3P[Pd(dmit)2]2 is an insulator that becomes a conductor under certain conditions. It also has a number of unusual properties owing to the relationship between some of its energy states and its crystal structure. By studying this transition in detail, Majed Abdel-Jawad from the RIKEN Condensed Molecular Materials Laboratory and co-workers have now discovered that the insulator-to-metal transition shows a universal behavior that applies to all related materials ("Universality Class of the Mott Transition"). “This means that once a phase transition is associated with such a universality class, all physical properties of this transition can be predicted,” explains Abdel-Jawad. EtMe3P[Pd(dmit)2]2 is an organic charge-transfer salt in which half of the electronic states that can contribute to the material’s electrical conductivity are occupied by electrons, and the other half are empty. Usually, this would mean that the material is a good metallic conductor, because electrons can freely travel around by moving in and out of the empty sites. In this organic material, however, strong repulsion between the electrons in the full and empty states suppresses free movement. 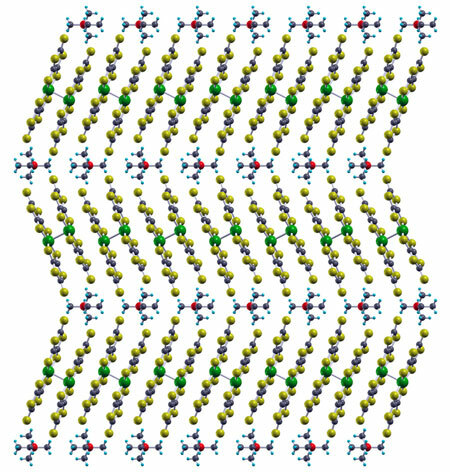 The layered structure and arrangement of molecules into layered, triangular patterns (Fig. 1) removes the freedom of the electrons' spin such that the molecules line up and form valence bonds. The only way for electrons to break free is to forcefully add additional electrical charge to the system, or to subject the material to high pressure. In both cases, the electronic states change such that the material undergoes a Mott transition to a conducting state. Studying the Mott transition with the precision required to unravel fundamental physical properties, however, is particularly challenging. Therefore, rather than relying solely on electrical conductivity measurements, the researchers combined these observations with thermoelectric power measurements, which track changes in electrical behavior with temperature. The experimental data clarified previous conflicting experimental results and revealed that the Mott transition belongs to a universal class of phase transitions. Although this discovery provides a deeper understanding of Mott transition materials, many specific properties of EtMe3P[Pd(dmit)2]2 remain to be determined, notes Abdel-Jawad. “For example, we do not fully understand the conductivity of the insulating side of the Mott transition.” Additional experiments on this unusual compound therefore promise the discovery of further intriguing physics beyond the phase transition itself.